Have you ever actually read the warning label to see what is dangerous the chemical you’re using? I’m pretty sure I have once or twice and read “blah, blah, don’t swallowed, blah, blah, death, blah, poison control,” all the normal stuff, chemicals with more consonants than we can pronounce. The death warning isn’t a big deal until there are curious little ones that take “no” as a challenge. So, I’m here to give you the basics on why basic household chemicals are dangerous if misused or ingested. Ammonia: Found in common glass cleaners. Ammonia can irritate your lungs/respiratory system if you inhale it. This can happen if you get too vigorous about spraying grime. Ammonia can also chemically burn your skin if it comes in contact with it. Last note, if mixed with products that contain BLEACH this can produce DEADLY GAS. Much worse than your husband’s, so don’t do it and be aware of the chemicals you’re using while cleaning. Bleach: Found in lots of cleaners. Not gonna lie, I have loved me some bleach to kill mold lurking around the house. But, I digress, the dangers of bleach include irritation and damage to skin and lungs if it comes in contact. True story, I may or may not have cleaned with bleach without rubber gloves on and have experienced said burns. Important note, never mix bleach with AMMONIA or other acidic cleaners, including vinegar, as this also causes DEADLY GAS. Drain Cleaner: Found in the stuff to get rid of sink hairballs. Can cause serious chemical burns on skin, toxic (death) if swallowed, and may cause blindness if cleaner comes in contact with your eyes. Seriously, those chemical burns hurt. Laundry Detergent: Found in the laundry room, duh. If you swallow the soap, expect nausea, vomiting, convulsions, or possibly coma. It may also cause skin irritation even after rinsed off your clothes. Little sister had a mystery rash so we switched to dye and fragrance free detergent, the mystery rash disappeared. Oven Cleaner: Found in cleaning artillery. Goodness, this stuff is amazing for those tough grease spots. However, this cleaner is highly corrosive and can cause nasty chemical burns on your skin or lungs or possible death if swallowed. 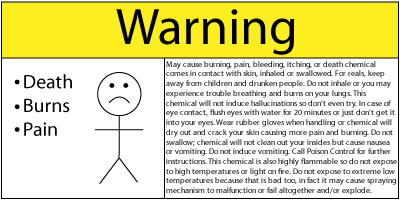 And by nasty chemical burns I mean painful red, cracked, dry, bleeding, burning skin. Might have experienced this one too while in college. Word to the wise lazy, wear gloves when cleaning with chemicals or suffer the painful, burning consequences. So let me sum up, most all of these popular chemicals can cause nasty chemical burns to your skin and lungs, death if swallowed, and awful deadly fumes if mixed with other chemicals. Just think, these chemicals are meant to make surfaces safe for us. just re-tweeted this. people need all the reminders they can get the most cleaning solutions are deadly. Finding the right green cleaning solution for the job takes time and some experimentation, but it’s totally worth it to protect your health. Thanks! I appreciate you sharing my post. Green cleaning is worth it not only to protect your health but the health of your family and the people that come into you home. These are great reminders about how we’re affecting our health and indoor air quality in pursuit of cleanliness. I always used to wonder why I felt so sick the day after cleaning house, then started reading about the dangers of bleach. Yep, I loved me some bleach for mold-killing, too. No more!